Mª Ángeles García Asensio, Carlos Aguilar Paredes, Lucía Jiménez Iglesias, Cristina Ruiz Moreno, Lydia Sánchez Gómez (2018): “Reported speech as an indicator of internal pluralism in the media: the case of the news programmes of TVE and TV3”. Revista Latina de Comunicación Social, 73, pp. 991 to 1015. Introduction: The objective of this work is to analyse the impact of reported speech on the way TV news programmes address political information in order to study its relevance as an indicator of media internal pluralism. Methodology: A linguistic and discursive content analysis was performed on a sample of political news pieces broadcast by two primetime TV news programmes (TVE1 and TV3) in pre-election period, and a comparative analysis was carried out to assess the representation of political actors. A quantitative-qualitative method and a sequential, nested design are used to analyse the use of reported speech to represent political actors. Results: The results show differences on the way the image of political actors is constructed and in the reproduction of their public speech. Discussion and Conclusions: It is necessary to incorporate reported speech as an indicator to observe media information quality. Reported speech; pluralism; TV news programme; political speech; quotations; words; verbs. 1. Pluralism and reported speech. 1.1. The concept of internal pluralism. 1.2. Reported speech. 2. Objectives and methods. 3. Results. 3.1. Quoted voices. 3.2. Types of quotations. 3.3. Verbs of communication. 3.4. Types of words. 3.5. Combined analysis of all three variables. 4. Discussion and conclusions. 4.1. Quoted voices. 4.2. Types of quotations. 4.3. Verbs of communication. 4.4. Types of words. 4.5. Development of a narrative through reported speech. 5. References. This article studies whether the analysis and evaluation of the degree of internal pluralism of the media should include the way in which the media represent political actors and their public speeches through the various forms of reported speech. From our perspective, internal pluralism and reported speech are deeply related, because reported speech is one of the most effective discursive procedures at the service of the media to develop an image of reality, which is plural in terms of ways of life and presents “rival axiological convictions” (Habermas, 2000, p.130). In particular, in the journalism that is carried out on TV news programmes, measuring internal pluralism taking into account only the time of appearance on the screen of the different political actors, is revealed to be necessary but also insufficient. In this regard, this research provides new data -supported on qualitative and quantitative research- to the studies that show that the journalist who builds the polyphonic scaffolding of his informative speech does not only has the authority to include or exclude external voices in his journalistic discourse and to give them time on the screen (Santander, 2003, p.26). This journalist, through the use of discursive operations of direct or indirect quotation, can also argumentatively disable these external voices through di-authorising assessments, in a way that the choice of a particular form of quotation or the use of one or another verb of communication can render inoperative a political voice, its public image and its ideological approach (Casado Velarde and Lucas Vicente, 2013). All of this, as a result, can affect the commitment with the internal pluralism acquired by the media. There are few studies that address this bias in the use of reported speech in news programmes broadcast in Spanish TV (Fernández García, 2003). On the contrary, there are abundant studies on the use (and abuse) of reported speech on the written and digital Spanish press (Méndez, 2000b; Casado Velarde, 2008; Escribano, 2009; Sánchez García, 2012; Casado Velarde and Lucas Vicente, 2013; Repede, 2015). “Pluralism may be internal in nature, with a wide range of social, political and cultural values, opinions, information and interests finding expression within one media organisation, or external in nature, through a number of such organisations, each expressing a particular point of view”(Council of Europe, 1994, p.8). Internal pluralism has to do with the diversity of political, social and cultural values, and the diversity of information, opinions and interests expressed within a medium. This diversity, treated with journalistic rigour and values of informativity and factuality (Waugh, 1995), has a direct impact on the image that citizens receive from the events that are reported, and configures different states of opinion in citizens based on a plural conception of reality. In this sense, different audiovisual regulatory bodies have been created in the European context to oversee and protect the internal pluralism that society demands from the media, especially when dealing with contents pertaining to national and international political life (Almirón, Capurro and Santcovsky, 2010). Some examples are the Conseil Supérieur de l’Audiovisuel (CSA) in France, and the Consell de l’Audiovisual de Catalunya (CAC) in Catalonia. The French CSA oversees the reform carried out in France in 2009, which guarantees that 50% of the total screen time of television coverage goes to the parliamentary opposition, both in election and non-election periods (Almirón et al., 2010). For its part, the CAC also uses a quantitative method that counts the total time of the news devoted to a single theme, and the times and frequency of appearance on the screen of political and social actors. However, this surveillance operates only during election periods (López, 2006). However, although these quantitative mechanisms govern the appearance of a variety of political actors, they do not guarantee by themselves plurality in the strict sense. In addition, they force the modification of journalistic criteria by establishing quotas that do not necessarily respond to informational criteria, but to political agreements for the regulation of public media (Almirón et al., 2010, p.28). Similarly, there is no qualitative element or agenda to monitor the presence of political actors in the public media, which makes even more difficult to determine the real degree of pluralism. In this context, Spain does not have a specific organ to regulate the informative activity of the media. The General Law on Audiovisual Communication (LGCA) (2010) proposed the creation of the National Council of Audiovisual Media (CEMA), but the project never materialised (Fernández, 2016). Still, this legal text is the only one that mentions the concept of pluralism in the media sense and makes reference to its duality (Aguilar et al., 2016). Subsequently, the implementation of the National Commission of Markets and Competition (CNMC) as a single and multi-sectoral regulatory body has failed to overcome major shortcomings in the supervision of the plurality of audiovisual content (Gavara de Cara, 2013). In fact, the characterisation of the Spanish media system tends to reiterate this absence of a specific regulatory body, and its impact on the lack of internal pluralism. Specifically, Hallin and Mancini (2004) present Spain as an example of the Mediterranean or polarised pluralist model, which, as such, and in these circumstances, shows a high degree of state intervention and political parallelism: it lacks a diversity of information and political opinions expressed within each medium because political journalism is highly polarised towards specific ideologies. Humanes et al. (2013) also mentioned the Spanish case when observing that internal pluralism is scarce in the media systems that show a strong political parallelism. They conclude that the Spanish media system, which continues to revolve around television, is divided between the duty of public service and commercial television. Thus, although television -especially the public broadcaster – has been made responsible for ensuring internal pluralism (Strömbäck and Luengo, 2008; Fernández and Fernández, 2012), researchers are still questioning the guarantee of internal pluralism in the Spanish media. Berganza, Van Dalen and Chaparro Domínguez (2010) and Van Dalen (2012) have added to the discussion on pluralism in the Spanish media the opinion of political journalists, who highlight that the main constraint to their professional autonomy are the political and economic pressures arising from within media organisations. This is reinforced by evidence that there is a symbiotic relationship -not based on competition or a watchdog activities- between political journalists and politicians and so both sides need each other: politicians need journalists to get media exposure and journalists need politicians to get first-hand news to generate audience (Berganza et al., 2010). In short, the impact of political and economic pressures, the symbiotic relationship between journalists and politicians, as well as the absence of specific regulatory bodies is what characterise the current Spanish media landscape and necessarily affect the quality of information of political news. Regulatory actions in this context are inoperative and are a mere reflection of the balance of political forces. Therefore, the temporal analysis used as a quantitative reference of internal pluralism has become an instrument to document the action of information services that can hide the real narrative of political actors, as well as the setting of their political agenda. In this context, the analysis of the reported speech mechanisms that journalists use to represent the voice of political actors in their journalistic discourse can add a qualitative perspective to the study of the actual degree of internal pluralism of each medium, which is an essential complement to safeguard fairness and plurality in the treatment of the news. The news included in the discourse of a TV news programme include fundamentally two types of content: reported events – news events - and statements - speech acts - of the main actors related to these events, which becomes a persuasive mechanism that underlines the factual nature of the events narrated and gives credibility to the journalistic discourse (Van Dijk, 1990; Vicente Mateu, 2007). These statements, in the political sphere, often become the news in themselves (Martínez Pasamar, 2010). This occurs because they are spoken by social agents of public relevance and because their value is decisive for the functioning of the political activity (Escribano, 2001; Charaudeau, 2003; Sánchez García, 2010; Lucas Vicente, 2014). The use of reported speech allows journalists, in the development of a news narrative, to interpret and reproduce complete or selected segments of external statements, and to represent the communicative situation in which each statement was originally said. As Escribano (2009) and Lucas Vicente (2014) point out, a journalist not only transmits the words spoken in a statement when performing an operation of reported speech, but also interprets the intention with which those words were spoken. This reproduction of the external speech can be done with greater or lesser fidelity to content, to the intention and the form of the original speeches (Méndez, 2000a). The result is that two kinds of voices converge in the informative story: the voice of the journalist, who selects, reworks and transmits the statements, and the voice of the politician, the main actor of events or the statements of others (Waugh, 1995; Santander, 2003; Sánchez García, 2010). In this way, the political discourse is represented within the journalistic discourse (Sánchez García, 2010). Some studies on written news (Méndez, 2000a; Casado and Lucas Vicente, 2013; Lucas Vicente, 2014 and 2015) highlight how through the use of reported speech and thinking verbs (believe, think, opine, consider, remember) or verbs of sensitive perception (see), the journalist attributes to another subject a speech that has never been spoken, but is represented as if the subject would have thought about it and said it. It is a unspoken speech that the journalist seems to infer, with free and creative interpretative procedures, fruit of his subjectivity, based on contextual information or original statements that were previously verbalised, which in principle should not be allowed in the conventions of genre, which is linked to facts and the values of objectivity and truth. This is why, following Lucas Vicente (2014), in this research, reproduced discourse –the reproduction or quotation of other people’s speech– is understood as the attribution of a speech to a textual statement made by other than the presenter. Thus, we have speeches that have never been spoken or written but have been inferred by the journalist as part of his interpretation of reality. In this sense, the verbs of intellectual perception (of thought and perception) are considered as the most highly evaluative and, therefore, the most highly subjectivising (Méndez, 2000a), against the use of the verb say,which is the most highly objectifying and archilexeme of verbs of communication (Kerbrat-Orecchioni, 1986). Between intellectual perception verbs and the verb say, there is, on the one hand, a continuum of verbs that give objectivity to the journalistic discourse: declarative verbs such as affirm, declare, present, add, etc., whose main function is to express an assertion; on the other hand, there is a continuum of subjectivising verbs, such as recognise, admit, confess, warn, promise, threaten, highlight, accuse, denounce, criticise, claim, demand, and regret, which are used as the journalist wants to the words spoken - or inferred - in his speech to be interpreted. In fact, it is mostly through subjectivising verbs that the journalist can position himself for or against a certain political voice and, therefore, enhance his image, if the verbs show a positive content; or undermine it, if the content of the verb is negative (Casado Velarde and de Lucas Vicente 2013; de Lucas Vicente, 2015). It is worth noting that quotations are managed in the speech primarily through verbs of communication and that their analysis is therefore essential if the reported speech is included in the research on the degree of internal pluralism of a news media company. Thus, through textual operations required by the reported speech and, very specifically, through a conscious selection of certain verbs of communication, the journalist has the authority to evaluate the content with more or less ideological bias or more or less professional rigour. To this we have to add the previous selection of the political voices that the journalist wants people to hear, or his authority to determine a hierarchy of voices that can affect the cognitive processing of the public (Rosier, 2002; Santander, 2003; Fernández García, 2003; Escribano, 2009). Even more so when, according to Charaudeau (2003), the journalist include or exclude for reproduction certain words said by the political actors to create different images of them: an actor who makes decisions (his words are performative), who analyses current affairs (analytical or explanatory words), or who assesses and expresses a judgement about events and statements (evaluative words). We can also add the image of an agent who seeks a reaction from the public (directive words) or offers an assertion (declarative words). In short, the presence or absence of voices representative of political actors, the construction of a certain image and the power of selection, concealment or manipulation of statements - of their contents or their communicative intentions - are often indicative of the affinity of a medium with one or another political party. These variables can be employed, therefore, as an indicator of the degree of internal pluralism of the medium, because they can affect the inclusion in the journalistic discourse of voices of the disparate ideologies that make up the political landscape as well as the image of the agents of social relevance (Moirand, 2007). Here it is necessary to specify how the forms of quotation that journalists selected to integrate in their discourse the voice of politicians also influence citizens’ perception of politicians and, therefore, the degree of internal pluralism shown by each medium. Thus, in television news there are four main types of quotations (Charaudeau, 2003; Santander, 2003): audiovisual, direct, indirect and narrated quotations. Audiovisual quotation corresponds to statements recorded in image and sound, in their original communicative context, and in the narrative development of a news video: unless there is manipulation, recorded images and sounds do not alter what was said originally. On the other hand, the direct quotation is expressed by the voice of the journalist, who reproduces with a discursive fiction of literalnessthe words originally spoken, even if it lacks images of the moment in which these words were spoken or shows these images in the background. Indirect quotation is told through the voice of the journalist, as well as the narrated quotation. The latter reduces discourse that reproduces a verb of communication and a nominal or prepositional syntagm (Méndez, 1999; Santander 2003). Audiovisual quotations, due to their claim of literalism and enunciative characteristics, are in fact a type of direct quotation; the narrated quotations, in turn, are an extreme type of indirect quotation. Specifically, choosing an audiovisual quotation in a TV news programme or a direct quotation expressed by the voice of the journalist (objectification effect); or by an indirect quotation (effect of manipulation and interpretation) or a narrated quotation (dramatic effect), involves varying degrees of journalistic subjectivity (Charaudeau 2003). This degree of subjectivity, very pronounced in narrated and indirect quotations, and weakened in the audiovisual and direct quotations, implies that citizens will grant greater credibility to political actors who are quoted by a direct or audiovisual quotation. Not in vain, the more indirect a speech is, the more possibilities of manipulation the journalist has to transmit his own evaluations and views on the reported words (Fairclough, 1988; Waugh, 1995; Ruiz, 2006; Escribano, 2001 and 2009; Sánchez García, 2010 and 2012; Bednarek and Caple, 2012). The objective of this study is to analyse the relevance of including the analysis of reported speech as an indicator of the degree of internal pluralism in television news programmes. To this end, we have performed content analysis from a linguistic and discursive point of view, based on three elements of reported speech: types of quotations, types of words and types of verbs. The analysis is performed on a sample of 91 national political news, presented in the primetime general-information news programmes of Catalan regional television (sub-sample TV3) and Spanish national television (sub-sample TVE1). Therefore, this sample of news comes from newscasts of public TV channels whose election responds to criteria of proximity and public service. Specifically, the sample includes news broadcast from 24 November to 3 December 2015. The reason to choose this period, despite its proximity to an election period, is to avoid any imperative legal restriction on the time dedicated to each political actor onscreen. We should take into account that the general elections were held on 20 December 2015, and that the Central Election Board forced broadcasters to respect the stipulated quotas of appearance on screen of political actors only during the fifteen days prior to 20 December, i.e., during the election period. This period does not include our sample of TV news programmes. However, we still consider that proximity to the election campaign could lead the selected news programmes to show some degree of political instrumentalisation. Of the sample of 91 news, 47 were broadcast by TVE1 and 44 by TV3. The total length of the body of 581 quotations. This sample of news was subjected to a complete and standardised orthographic transcription of the verbal oral and written (signs) component of each story and its summary. Each transcribed text has a header that consists of a code, which refers to the news programme, broadcast date, and duration. The header of each transcribed news piece also specifies the type of news: event or speech act. The transcript of the oral verbal component is labelled to distinguish whether the text belongs to the intro read by the presenter of the news or to the voice off the journalist contained in the video; or to the voices of the protagonists of the news, journalists, correspondents or special correspondent, which are texts spoken spontaneously or with greater or lesser degree of spontaneity. Identify the political voices that are heard and classify them by political actors, differentiating whether they appear on behalf of government institutions or political parties. Identify the types of quotations that are introduced in the journalistic discourse by the voices of political agents and the contents said by these agents -or are inferred from what they said- and classify them according into audiovisual, direct, indirect or narrated quotations. Identify the verbs of communication introduced with the quotations and classify them into objectifying and subjectivising verbs. Identify the contents stated by political actors and classify them into performative, explanatory, evaluative, directive and declarative words. To do this, in the transcription of the news the variables of analysis were labelled, including the indicators and values of the reported speech (Table I). These variables are added to the matrix of analysis of the TV news programmes developed by Aguilar et al. (2016). Thus, for each quotation included in a news piece we identified the agent referred to in the piece, the type of quotation, words and verbs of communication used, classifying according to the categories shown in Table I. The quoted voices that correspond to members of parties or coalitions are grouped for this study as voices of political agents of political parties of the national and regional parliamentary arc, as appropriate. In addition, five 2-hour-long sessions were dedicated to unifying criteria to make sure the coding system was agreed upon. After the classification, two sessions were carried out to unify criteria with the presence of an expert who validated he criteria and the results obtained in the transcription and classification processes. The analysis of news allowed us to identify the different voices quoted by journalists, and the type and content of the quotations associated with each of these voices, as well as the verbs of communication used to introduce their words. With respect to the first analysis variable, the results show that the arc of these quoted voices is wide, although the only significant results are those that correspond to the categories members of the executive branch (both national and regional) and representatives of political parties (Table II). The rest of the categories have very few quotations and do not allow for statistical analysis, so the rest of the political actors (trade unions, social forces, legislative power, etc.) are merely accessories in political information. Table 2. Identification and classification of political voices quoted in TVE1 and TV3. In total, 43 voices are quoted in TV3 and 37 in TVE1. Table III shows the political actors with the higher number of appearances. Some of them are quoted in two different facets, whether exercising the role of members of the government or representatives of their political parties. Table 3. People quoted on TVE1 and TV3. At the individual level, the most quoted political actors in TV3 and TVE1 are Artur Mas and Mariano Rajoy, respectively. However, it is not always easy to differentiate the role they exercise in the discursive reproduction of their public statements, because in the news the role as President is always present (even when they act as representatives of their political party). Therefore, counting both roles, Mas and Rajoy are the most quoted characters, and it is around them and their agenda that the speeches of most of the rest of the actors who appear in the news are built. However, to delve into the study of the respect of pluralism, it is still particularly relevant to observe how the reported speech is built through the different types of quotations, verbs and words. In absolute terms, the general behaviour of both television channels is symmetrical in terms of the type of quotations used (table IV). In both cases, the majority of quotations are audiovisual, followed by indirect and narrated quotations, although TVE1 resorts to narrated quotations almost twice as many as TV3 in the same period. Table 4. Distribution of quotation types. Table 5 shows that the national network offers a differentiated treatment for the figure of the President of the Government, for whom indirect quotations predominate (40%), followed by audiovisual (36%) and narrated (24%) quotations. On the other hand, with respect to the set of political parties, audiovisual quotations predominate (45%), and there is a balance between indirect and narrated quotations (24%), with a small percentage of direct quotations (2%). However, this treatment is not homogeneous, since the PSOE tends to be represented with a greater number of narrated quotations (31%), while Podemos and CUP are represented with a very high percentage of audiovisual quotations (56%). For its part, TV3 also offers a differentiated treatment for the President of the Generalitat, with 45% of audiovisual quotations, followed by indirect (33%) and narrated (22%) quotations. This treatment is very remote from that of CUP, for which indirect (41%) and audiovisual (37%) predominate, showing very similar values to those of En Comú Podem. On both television channels, the opposition parties receive a number of indirect quotation that is way smaller than that used to present the figure of the Head of the Executive. Table 5. Types of quotations according to the origin of the quoted voice. The breakdown of the verbs used by different actors, attending their objectifying or subjectivising character, is shown in Table 6. Table 6. Verbs of communication according to origin of quoted voice. As shown in the following Figure, in TVE1 there is a strong correlation between the objectifying and subjectivising verbs (R2 = 0.678). Therefore, the existence of three cases placed far away from this trend is striking: the President of the Government, the PP and Podemos. Moreover, although the correlation in the case of TV3 is moderate (R2= 0.56), there are two similar deviations in the behaviour of Jxsí and the CUP. Figure 1. Correlation between objectifying and subjectivising verbs (TVE1 and TV3). Even more significant is the treatment of verbs combined with the type of quotation (Table 7). The combinations of indirect quotations with objectifying verbs are characteristic of the institutional representations and the President of the Government. The treatment of the President of the Generalitat on TV3 is outstanding, with a large number of narrated quotations with subjectivising verbs. With respect to the parties, there are major differences once again (especially for the CUP and Jxsí). In TV3, quotation with subjectivising verbs are 62% for the PP, while Podemos is presented especially with indirect quotations and objectifying verbs, and the PSOE and the Jxsí with indirect quotations and subjectivising verbs. Finally, with respect to the type of words that the journalist selected to represent the speech of the political actor, the representatives of the national administration mainly use explanatory and evaluative words (table 8). On the contrary, the CUP and Podemos use an unbalanced number of performative and evaluation words: these two formations build up a much higher percentage of reproduced performative and evaluative words than the rest of the political parties. On the other hand, Jxsí has an abnormally high of evaluative and directive expressions (five times more than any other political party in TV3). Table 8. Types of words (in %). To appreciate the differences in the configuration of the quotations it is necessary to resort to the three variables, and their combination to establish the narrative criterion (Tables 9 and 10). Table 9. Types of quotations, words and verbs TV3 (% of quotations). Source: Authors’ own creation (mixed quotations were excluded). Table 10. Types of quotations, words and verbs TVE1 (%). In both cases (TVE1 and TV3), the three analysed items (types of quotations, verbs and words) are interrelated. Thus, for political actors whose speech is reproduced mainly through narrated quotations and subjectivising verbs (PP in TVE1, Jxsí in TV3), evaluative types of words were selected to present their speech. Collected data were analysed quantitatively, through a mixed nested procedure (Verd and Pérez, 2008) to establish regression relationships between variables, and qualitatively, to corroborate the initial hypotheses. Beyond the level of trust that quantitative data can provide, the selected quotations were analysed qualitatively to determine to what extent their use (without specifically analysing the meaning) allows for the creation of a personalised narrative for each political subject, and sets the agenda that is offered to the viewer, thus contravening the plurality function entrusted to the media. Finally, the behaviour of two television channels are compared to establish whether there is some sort of relationship in their treatment of political actors. The identification of the political voices quoted in TVE1 and TV3 allowed us to observe the variety of political actors represented in both channels (Table 3). However, the detailed analysis of the frequency of appearance of the main political figures indicated that the speeches of Mariano Rajoy in TV3 and Artur Mas in TVE1 are hardly represented. The analysis shows a media landscape in which each of the networks presents a different political scene, giving space to the debates and political struggles of the territory they cover. On the other hand, the analysis of the quoted voices also showed that in TVE1 and TV3, in the majority of cases, it is unclear the role played by the politicians represented in the news. Thus, the personalised conception remains above the institutional one; politicians are represented more as characters than as institutions, resulting in the creation of a narrative. This preponderance of the figure over the institution shows how television take for granted that viewers distinguish by themselves the role played by every politician that is represented. As a result, the winner is the idea of institution, which grants a higher level of credibility, even when, in fact, the political actor is representing its own party. For this reason, the results of the analysis of the quoted voices confirms rather than observing who is quoted, what truly matters is to analyse how reported speech is built through the different types of quotations, verbs and words. The distribution of quotations in the two selected television channels follows very similar patterns, as shown in table 4, and presents differentiated treatments for the institutional actors and the rest of political actors. With regards to the type of quotations in their differentiated patterns, there is an increased use of the narrated quotation in TVE1. The narrated quotation is a very synthetic, highly interpretive, form of speech reproduction which rather than privileges what has been said, it highlights the issue that is being addressed and, through a subjectivising verb, interprets the communicative intention of what was said. The use of this type of quotation allows the journalist to give a narrative to the character he introduces, giving it weight in the medium’s agenda as a generator of a speech act, which reflects specifically how the journalist values, interprets and evaluates the character’s communicative intention. It is the most frequent quotation in the reproduction of the speeches of Artur Mas in TV3, and frequent for the speeches of Mariano Rajoy in TVE1. Both Presidents receive this differentiated treatment, perhaps because their political relevance requires greater interpretative effort by the journalist (or because the journalist strives to interpretive what is said and, above all, the communicative intention of the highest-hierarchy agents within the political sphere). 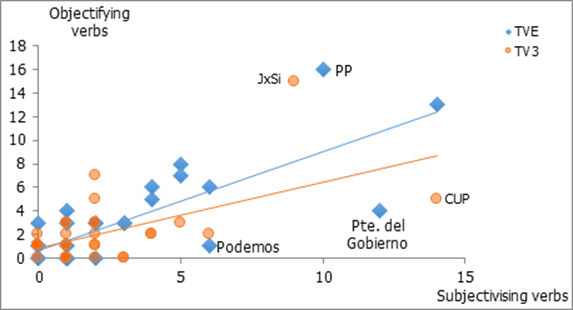 With respect to this variable, the national network also shows the same differentiated treatment for the two political parties (PSOE and Jxsí), whose speeches are also reproduced with more narrated quotations than those of the rest of the political formations: they are the parties that oppose the political line led by President Mariano Rajoy and, therefore, are his dialogic rivals. Once again, these speeches deserve the interpretative and evaluative attention of the journalist. In the same vein, TV3 accumulates indirect, highly interpretative, quotations for opposition parties - whose speeches are reproduced with a smaller number of audiovisual quotations, which are the most objectifying-. It is relevant that, in both channels, the use of more objective resources (such as objectifying verbs and audiovisual quotations) is not necessarily linked to a better representation of the political actors in terms of internal pluralism. The selection of the pieces and their presentation in more objective formats in most cases responds to replicas of items in the agenda of those executives and parties that have supported them. These informative pieces are treated with a higher level of complexity in their preparation, setting up their own dominant discourse on the group of news that relegate non-government parties to secondary-role actors, whose proposals do not require a thorough treatment as they are always framed in the discussions of other political forces. Journalists use objectifying verbs and subjectivising verbs to introduce the reported speech in the narration of news pieces. With regards to the objectifying verbs, it is important to emphasise their majority use (75%) in the indirect quotations attributed to the Prime Minister in TVE1. Surprisingly, something similar occurs in TV3 (60%) with the objectifying verbs in indirect quotations attributed to the President of the Generalitat. These verbs do not reveal the journalist’s interpretation of the original communicative intention, so the weight of the quotation does not lie as much in the verb or the interpretation of the communicative intention of the political actor’s public discourse, as in the reproduction of the content -which is summarised or paraphrased- of the actor’s speech and, therefore, in the kind of words that are reproduced. This results in an increase in journalistic objectivity, although the indirect quotation, because it stays away from claims of literalness, still feels, as a whole, a result of the journalist’s subjectivity. In fact, the most subjectivised political actor in TVE1 is Mariano Rajoy, for the use of the formula: narrated quotation with subjectivising verb. The reproduction of his speeches use such verbs as: defend, highlight, emphasise, or warn. These verbs present the President of the Executive Power as a man of law, an agent that promotes actions for the maintenance the law and order. The subjectivising verbs of the narrated speech build up the image of the President. On the contrary, the speech of the leader of the opposition, Pedro Sánchez, is depicted with mostly objectifying verbs of communication, which give a differentiated treatment to both political actors. The same phenomenon occurs in TV3 is with respect to the figure of Artur Mas. The President of the Generalitat is also depicted with narrative quotations and subjectivising verbs such as regret, accuse, ask, urge, or stress. These verbs are, again, charged with interpretation of communicative intentions which, in this case, depict the President as a victim who negatively assesses events or other people’s statements. Indeed, Artur Mas, based on his reported speech, is shown constantly defending himself from attacks by the central Government - in this case, in relation to the payments of the FLA- and the opposition of the CUP. There is an asymmetric representation of political actors, which is complex for members of the Executive Branch and much more direct and objectivised for the opposition. Both television channels show, finally, a tendency to resort to subjectivising verbs in the quotations attributed to the political parties that support the actions of the Government of the PP and Jxsí, respectively; and in the case of TV3, to use objectifying verbs in quotations referring to the CUP, which concentrates 45% of all the objectifying verbs in the sample. The representatives of the Government pronounced the largest number of analytical words (explanatory) and an abundant number of evaluative words (table 8) in the sample of television news. On the contrary, the CUP and Podemos pronounce an unbalanced number of performative and evaluative expressions. On the other hand, Jxsí has an abnormally high index of evaluative and directive expressions (five times more than in any other political party in TV3). With regards to the type of words, the analysis confirms that TVE1 offers a differentiated treatment for the PP and the PSOE: the evaluative words ostensibly predominate in the speech of the PSOE, which hardly pronounces explanatory words. In the case of the regional channel, evaluative words predominate for all actors, existing a balance in the selection of performative and explanatory words. This is the case for all the political formations except for the CUP, which is represented with a greater trend towards declarative and directive words. The type of words selected predominantly from the public speeches of each political actor also builds their social image. After identifying the political actors represented in the sample of news, and analysing three items: type of quotations, type of verbs of communication and types of words, which are used to reproduce their public speeches, we confirmed that in both cases (TVE1 and TV3) these items are related to each other. The use of the narrated quotation with the subjectivising verb that introduces evaluative words stands out, due to its impact on the differentiated construction of the image of political actors. On the other hand, the use of indirect quotations is related to a high development of the speech and is used with the opposition parties (in the case of TV3 is also related with the figure of Mariano Rajoy). In all these cases, the process of elaboration of contents, which seems to be oriented to the processing of information prior to its broadcast, is significant. With regards to political parties, the most extreme case of deviation occurs in the treatment of the PSOE in TVE1: this party is differentiated from the rest of the political formations in the three elements of the reported speech: type of quotation, type of verb of communication and type of words selected from the speech of its leaders (more evaluative/subjective than in the case of other parties). On the other hand, there is also a differentiated treatment in the kind of words used by the members of the PP, given that they use more explanatory words than the other parties, as it occurs with institutional actors. In the case of TV3, it is important to remember the context of negotiations between the Jxsí and the CUP for the investiture of Artur Mas as President of the Generalitat. The antagonistic reality between these two parties is represented in the news programme through a differentiated treatment in the type of verbs used to represent each of them. While the quotations of the members of the CUP are introduced mostly by objectifying verbs, the speech of the leaders of Jxsí is presented with subjectivising verbs. In addition, there is also a differentiated treatment in the type of quotations use with Podemos, the PP (more audiovisual/objective in these cases) and the PSOE (more narrated/subjective). Having analysed the different quoted political voices and the three elements that comprise reported speech (quotations, words and verbs), the results of this research show that the news programmes of both channels, in their discourse, give a differentiated treatment to the members of the Executive Branch (in particular, to the President of the Government, in TVE; and the President of the Generalitat, in TV3) and to political parties. This distinction shows that not all political actors can be represented in the same way because the reality of the actors with greater institutional work is limited (official acts, statements...). Therefore, the variety of quotations that can be used to reproduce their speech is also limited. So it is not surprising to find out that Ministers, members of the Constitutional Court and the Prime Minister / President of the Generalitat are represented with certain types of quotations, verbs, and fragments of their speech -selecting explanatory words, for example, or objectifying verbs- which sometimes tend to objectify them or present them as more objective with respect to the rest of the political actors. However, this circumstance does not justify the asymmetry that this treatment constitutes for the rest of the actors. Ultimately, what happens is that news-making allows the construction of a narrative. The type of quotations used and their combination allow the orientation of the news to form a speech which has at the centre the heads of the Executive Power, and that revolves around the elements of the agenda that they introduce. The rest of the political actors are not active agents in the introduction of items on the agenda and, therefore, receive a much more direct narrative treatment that prevents viewers from assess them beyond the framework proposed by the main actor. The responsibility of this presentation lies on television channels and, while we cannot deny that in terms of time and representation they follow acceptable plural patterns, they do not do so when it comes to structuring the discourse of the represented actors. A plural news programme should not only represent all political actors and quantify their on-screen time but should also create narratives for all of them according to the objective view of journalists, but also according to the image that each actor wants to convey in terms of agenda. In other words, the news programmes should visualise the different political agendas in the terms in which the different political actors want them to be presented to the viewer. From this perspective, we must conclude that internal pluralism on the selected news programmes is biased due to their use of reported speech. Thus, although the proportional allocation of time for each party is correct, the analysis shows the existence of bias in the treatment of the different political actors, which creates doubts as to the degree of pluralism in the news. For this reason, journalists should seek other objectifying elements that allow us to observe the democratic quality of the medium. Pluralism is not easy to address as it is a complex concept that includes many dimensions (one of them being the creation of the image). In this sense, this article proves that the way of referring to the speech is an element that allows us to determine deviations in the treatment of political actors, i.e., in the form of building their image on the TV news programmes. On the other hand, if TV news programmes build the image of political actors through their reported speeches, in the context of this research we understand internal pluralism as the homogeneous treatment in the use of quotations for all political parties. However, as shown by the results, there is a tendency to represent certain political groups that is contrary to the general trend, which would suggest a discretionary news treatment. If so, the results would have a more serious implication in the case of these two public television channels, whose duty is to offer a quality information service to citizens. Lastly, the definition of media pluralism in the literature -which only distinguishes between internal and external pluralism- appeals to concepts that are hard to objectify or measure in the terms of pluralism that democracy requires. Thus, the laxity of the term hinders its regulation and observation in the media and highlights the inadequacy of the quantitative procedures used so far to guarantee the plurality of political content. The results of this work show the need to rely on qualitative elements to measure the democratic quality of the news and highlight the relevance of including reported speech, one of the most effective discursive procedures at the service of the media to develop an image of reality, as an indicator of internal pluralism. The development of this work is part of the research project titled: Development of socio-political education for democratic citizenship: design and implementation of teaching materials in social sciences (EDU2015-65621-C3-3-R), funded by the Ministry of Economy and Competitiveness of Spain. Almirón, N., Capurro, M. y Santcovsky, P. (2010): “The Regulation of Public Broadcasters' News Coverage of Political Actors in Ten European Union Countries/La regulación de la información sobre los actores políticos en los medios públicos de diez países de la Unión Europea”. Comunicación y Sociedad, 23(1), 205. Bednarek, M. y Caple, H. (2012): News Discourse. Londres/New York: Continuum. Berganza, R., Van Dalen, A. y Chaparro Domínguez, M. Á. (2010): “La percepción mutua de las relaciones entre periodistas parlamentarios y miembros del Congreso y de su influencia en las agendas política y mediática”. Revista de Comunicación, 9, 7-25. Casado Velarde, M. (2008): “Algunas estrategias discursivas en el lenguaje periodístico de hoy”. Boletín Hispánico Helvético, 12, 71-97. Casado Velarde, M. y de Lucas Vicente, A. (2013): “La evaluación del discurso referido en la prensa española a través de los verbos introductores”. Revista Signos. Estudios de lingüística, 46(83), 332-360. Consejo de Europa (1994): “4éme Conference Ministerelle Europeenne sur la Politique des communications de masse. Les media dans une société démocratique”. Praga, 7-8.XII.1994. MCM (94)5. Estrasburgo: Consejo de Europa. Charaudeau, P. (2003): El discurso de la información. Barcelona: Gedisa. De Lucas Vicente, A. (2014): “Verdad y argumentación en la cita periodística”. Revista Española de Lingüística, 44(1), 39-64. De Lucas Vicente, A. (2015): “Hacia la construcción del paradigma léxico de los verbos introductores de discurso. Análisis de su tratamiento lexicográfico actual”. En C. Álvarez López, B. Garrido Martín y M. González Sanz (Coords. ), Jóvenes aportaciones a la investigación lingüística. Sevilla: Ediciones Alfar. Escribano, A. (2001): Pragmática e ideología en las informaciones sobre conflictos políticos. Salamanca: Universidad Pontificia de Salamanca. Escribano, A. (2009): Las voces del texto como recurso persuasivo. Madrid: Arco Libros. Fernández, I. (2016): “Independent Audiovisual Regulators in Spain: A Unique Case in Europe”. International Journal of Communication, 10, 359-376. Fernández, I. y Fernández, A. (2012): “Internal pluralism in the governance of public service broadcasters in Spain and the role of social groups and professionals. The case of RTVE”. Comunicación y Sociedad, 25(2), 203. Fernández García, F. (2003): Así son las cosas… Análisis del discurso informativo en televisión. Jaén: Universidad de Jaén. Habermas, J. (2000): Aclaraciones a la ética del discurso. Madrid: Trota. Hallin, D. C. y Mancini, P. (2004): Comparing media systems: Three models of media and politics. Cambridge university press. Humanes, M. L., Montero, M.D., Molina, R. y López, A. (2013): “Pluralismo y paralelismo político en la información televisiva en España”. Revista Latina de Comunicación Social, 68, 566–581. Kerbrat-Orecchioni, C. (1986): La enunciación. De la subjetividad en el lenguaje. Buenos Aires: Edicial. Martínez Pasamar, C. (2010): “Donde dije digo digo Diego: un recurso de desautorización de la prensa”. En C.
Martínez Pasamar (Ed. ), Estrategias argumentativas en el discurso periodístico (87-117). Frankfurt: Peter Lang. Méndez, E. (1999): “Análisis de la reproducción del discurso ajeno en los textos periodísticos”. Pragmalingüística, 7, 99-128. Méndez, E. (2000a): “La literalidad de la cita en los textos periodísticos”. Revista Española de Lingüística, 30(1), 147-167. Méndez, E. (2000b): “Análisis de las formas de introducir el discurso ajeno en los textos periodísticos: el contexto reproductor”. En J. J. Bustos Tovar (Ed. ), Lengua, discurso, texto (2081-2098). Madrid: Visor. Moirand, S. (2007): Les discours de la presse quotidienne: observer, analyser, comprendre. París: Presses Universitaires. Repede, D. (2015): “El discurso directo como estrategia de interpretación de la palabra ajena en los textos periodísticos”. Lengua y Habla, 19, 77-92. Rosier, L. (2002): “La presse et les modalités du discours rapporté: l’effet d’hyperréalisme du discours direct surmarqué”. L’information gramaticale, 94, 27-32. Ruiz, L. (2006): Hechos pragmáticos del español. Alicante: Publicaciones de la Universidad de Alicante. Sánchez García, F. (2010): “Usos y abusos del discurso referido en la prensa política”. Cuadernos de periodistas: revista de la Asociación de Prensa de Madrid, 19, 96-112. Sánchez García, F. (2012): El discurso referido en la prensa española. Madrid: Octaedro. Santander, P. (2003): “Acceso y discurso referido en el periodismo televisivo”. Revista iberoamericana de Discurso y Sociedad, 4(2), 9-32. Strömbäck, J. y Luengo, O. (2008): “Polarized pluralist and democratic corporatist models: A comparison of election news coverage in Spain and Sweden”. International Communication Gazette, 70(6), 547-562. Van Dijk (1990): La noticia como discurso. Comprensión, estructura y producción de la información. Barcelona: Paidós Comunicación. Van Dalen, A. (2012): “Structural Bias in Cross-National Perspective How Political Systems and Journalism Cultures Influence Government Dominance in the News”. The International Journal of Press/Politics, 17(1), 32-55. Verd, J. M. y López, P. (2008): “La eficiencia teórica y metodológica de los diseños multimétodo”. Empiria. Revista de Metodología de las Ciencias Sociales, 16. Vicente Mateu, J. A. (2007): “Discurso reproducido e interpetación de la fuerza ilocutiva en la prensa escrita”. Revista de investigación lingüística, 10, 225-242. Waugh, L. (1995): “Reported speech in journalistic discourse. The relation of function and text”. Text, 15(1), 129-173. Article received on 30 November 2017. Accepted on 20 May. Published on 23 May 2018.